We had a fantastic experience at Charnwood Forest Alpacas. Out in Leicester's countryside lies Charnwood Forest, full of beautiful bundles of fluff, and many of which we were lucky enough to spend some quality time with! There are a number of relaxing alpaca experiences to choose from, and we booked for both a Cria Watch experience, and a 90-minute Walking Experience with the alpacas. Both were brilliant! We have lined up outside the fence, each one of us a chatter of excited energy. In turn we are given the end of a rope, and gently encourage our quarry to follow us through to the open paddock. My new friend is all black, with mottles of golden fleece shining through, and his name is Two-Tone…. We had a fantastic experience at Charnwood Forest Alpacas. Out in Leicester’s countryside lies Charnwood Forest, full of beautiful bundles of fluff, and many of which we were lucky enough to spend some quality time with! There are a number of relaxing alpaca experiences to choose from, and we booked for both a Cria Watch experience, and a 90-minute Walking Experience with the alpacas. Both were brilliant! We started our adventure with the Cria Watch experience… a Cria is a baby alpaca! We were first given a quick talk full of interesting facts about the babies from our wonderful guide, Abbey. Did you know? That Cria can weight up to 20 pounds at birth? That’s the same as almost 7 human babies!! After a health and safety briefing, we were shown out to the fields were the young alpacas, and their mums, were grazing. The little cuties ran right up to fence to greet us, which was completely adorable! They obviously knew that new humans meant that it was time for food and cuddles! I would highly recommend buying LOTS of bags of food!! as they are greedy little fluffballs. They truly were endearing little characters, and it such an incredible feeling to be completely surrounded by them while they munched on our grain, and let us tickle them behind the ears. We then had a tasty lunch in the on-site chilli-bean cafe, where a much needed cup of tea was waiting for me… and we met this majestic ginger farm cat, who indulged us in a good session of purring and stroking. Our afternoon was spent getting to know a group of lovely alpaca boys. After another quick health and safety briefing from Abbey, we were paired up with our own alpacas. My new friend was called Two-Tone, who was very well-behaved, and really seemed to enjoy his walk! and Stuart’s alpaca was called Carpe-Diem, who was a little less well-behaved, and led Stuart around more than Stuart led him!! We walked our alpacas down a trail, that meandered through the fields and farmlands. Some of our party were a little unsure of their new walking partners, and there was a bit of stopping and starting before everyone was in stride. The excitable noises that the alpacas made as they walked were so charming and sweet, and really added a special tone to the countryside noises. 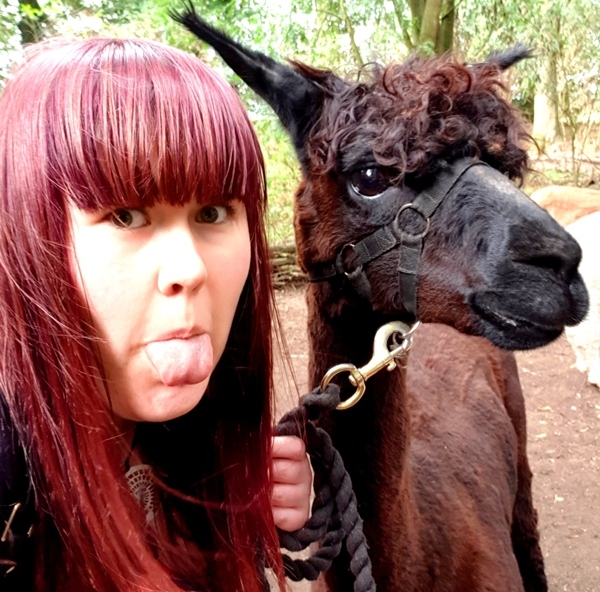 Around halfway into our walk we stopped in a little area of woodland for a chance to feed the alpacas, and of course take selfies! I would highly recommend both experiences… they were excellent. I left Charnwood Forest in a state of bliss, and I think the alpacas definitely had a therapeutic effect on me. Want to enjoy an enchanting experience with your own alpaca? Book here. Did you know? alpacas were originally bred specifically for the use of their coats. Alpaca fibers are still considered soft and luxurious today, and they are used in a variety of knits and woven fabrics. Alpaca fiber contains no lanolin and is therefore hypoallergenic. The fibers come in 52 natural colours. They range from true-black to brown, to white, and more. In ancient times, alpaca fiber was known as “Fiber of the Gods” and was often used to make clothing and blankets for royalty. All experiences must be booked online before visiting. Address: Scamhazel Farm, Ashby Rd, Boundary DE11 7BA OR use Google Maps here. There is an on-site cafe, ice-cream counter, and gift shop. Accessibility is limited. You have to be physically able to walk through uneven ground (pushchairs and wheelchairs are not permitted) for both the walks and the Cria experiences. Children are permitted on experiences but must be accompanied by an adult.